The Chicago Bulls won a close one in the last few seconds of the game. Final score 87-86. Derrick Rose had 27 points and Luol Deng had 18 points. **** This picture is of Derrick from Christmas Day, when they Bulls played the New York Knicks. Someone needs to tell the Miami Heat that there are 4 quarters in a game. Actually, don't. I like watching them lose. I'm down with Pat Riley, Erik Spoelstra, Zydrunas Ilgauskas, and Dwyane Wade. I'd toss LeBron James and Chris Bosh in two seconds. Regardless, I can already hear the "We need to take a long hard look in the mirror," talk and I've already silenced their voices and excuses in my head. Seems like just yesterday that those fools were counting all the championships that they were going to win on their fingers. Fools. Here's the clip of LeBron counting all the championships the Heat are going to win, now that the unholy union has been formed in South Beach. 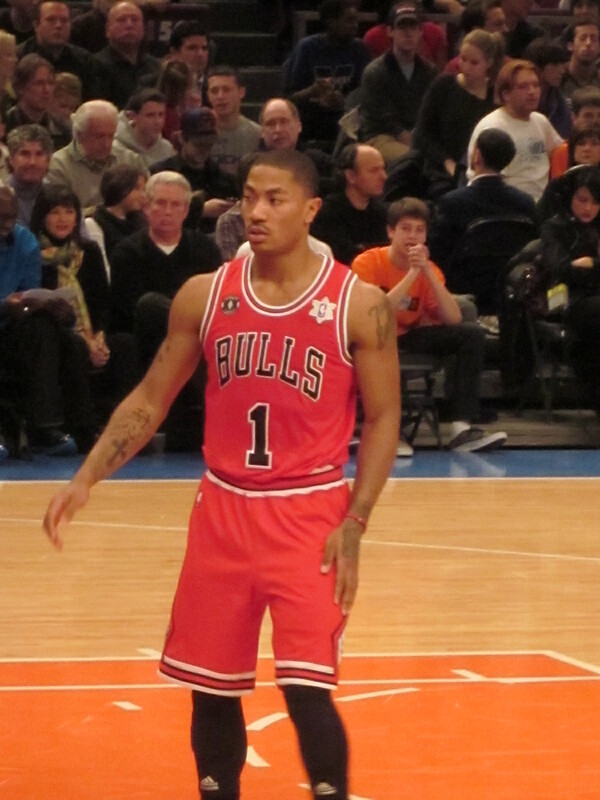 The Bulls and the Heat met most recently on February 24, and the Bulls won that game also. I'll share my favorite clip from that game with you. It's Carlos Boozer and Chris Bosh. Bosh falls and tries to sell a hard foul to the refs. It's pathetic. The Miami Heat are the anti-Charlie Sheen. They're not winning. Icing on the cake? According to Brian Windhorst (Twitter: WindhorstESPN), "Spoelstra said some Heat players are crying in the locker room at the moment." Seriously though. There's no crying in professional basketball. These guys need to man up. At least they didn't blame the refs for the loss like Gabrielle Union (i.e. Wade's girlfriend, Twitter: itsgabrielleu), "Congrats REF u just won the game...how does that feel???!! Great game...too bad the ref bet on the bulls." Good post, this topic has been a little polarizing this week with the backlash of them being crybabies then the people who defend them but in reality d.wade and lebron created this situation and would have been loved had they won 70 games and now that they are struggling are being made fun of. thanks! there's no crying in professional sports, unless you win a championship and they're tears of joy. college kids cry when their season is over because they're college kids. i don't need a guy in the nba crying to prove to me that he cares. show me a stat line that demonstrates he cares, not kleenex from TEARS. lesson to everyone the grass is not always greener. i am waiting for wade to take over, but i'm not holding my breath. did you know that the heat have to win 18 of there next 18 in a row to TIE cleveland's record of 61-21 a year ago? i didn't, but chris webber tweeted it earlier. WOW.